A. I got a lot of complaints like yours, including a masterpiece of analysis by Andy Ihnatko of Boston that was so thorough I believe he even disproved the existence of the movie itself. The key passage in my review was: "After the movie is over, and you are on your way home, some questions may occur to you." I now realize I should have written, "many fundamental, enormous and unanswerable questions may occur to you." But let me explain the reasoning behind my review. I believe the movie worked while it was playing. It presented me with a baffling disappearance and then seemed to address it with logic. 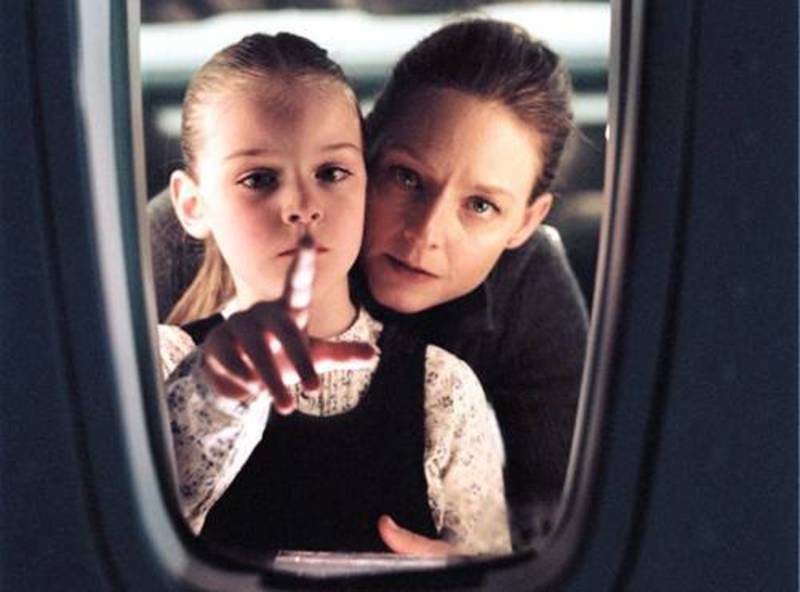 Then it turned into a film depending on the resourcefulness and imagination of the Jodie Foster character. Yes, I agree, after it's over, you realize there is no way all of the necessary conditions could have been counted upon. But you don't know that at the time, and while watching a thriller, it's what you know at the time that's crucial. If you also want it to all be plausible in hindsight, you're probably disappointed when a magician doesn't saw a real person in half and leave the severed corpse on the stage. Q. I saw "The Exorcism of Emily Rose" believing the ads: "Based on a true story." However, at the end of the credits, it says in plain English: "The events in this film are fictitious." What?! It's not the first movie to pull this, either. "Fargo" is a big one that comes to mind. Why do movies need to disguise themselves as based on reality? Sure, it seems more scary that way, but why do the filmmakers lie to us? Steven O'Brien, Blauvelt, N.Y.
A. The claim that "Fargo" was based on a true story was used by the Coen brothers, they explained, as a stylistic device. In the case of "The Exorcism of Emily Rose," the story is fiction, but it is technically "based on a true story" -- much changed in time, place and details, to be sure. The movie moved the story to America, focused on one priest and omitted most of the horrifying details of the real case, casting itself more as a sincere dispute between science and religion. According to "The Real Emily Rose" at fotofetch.com, my source for all that follows, the film was inspired by a case in the 1970s that represents the last time the Catholic Church officially recognized a demonic possession. It involved a German girl named Anneliese Michel, who was treated for seizures and given drugs over a period of five years before the church finally authorized an exorcism; its investigation indicated she was possessed by, among others, Lucifer, Judas, Nero, Cain and Hitler. From September 1975 until July 1976, she underwent a series of exorcism rituals, while refusing all food and "her knees ruptured due to the 600 genuflections she performed obsessively during the exorcism." A forensic exam eventually found she died of starvation. Two priests and her parents were found guilty of manslaughter and sentenced to six months in jail and probation. The German bishops then asked Rome to abolish the exorcism ritual; a revised ritual was published by Rome in 1999, but has never been used. Q. I agree with you that stop-motion animation has a magical quality. I've always been an admirer of both "King Kong" and the battle of the skeletons in "Jason & the Argonauts." Thank you for the Ray Harryhausen information [from Ebert's "Corpse Bride" review]; I didn't realize he was the genius behind "Jason" and "Sinbad." Do you think that because we grew up with stop-motion animation, we think it has a magical quality, and our nostalgia is involved? On a less serious note, am I mistaken in thinking that Victor made the wrong choice of a bride in "Tim Burton's Corpse Bride"? Emily, voiced by Helena Bonham Carter, has more spirit and is more attractive. Maybe it was her alluring blue skin, or the exposed cheekbones, but I think Victor should have decided to go for the corpse. Plus, she gave him a fantastic present ... the dog Scraps. Jason Miller, Tucson, Ariz.
A. What's more, Emily would never grow older. Stop-motion involves using actual physical models which are moved slightly between each frame of the film, giving the illusion of movement. Its modern incarnations include "Corpse Bride" and Nick Park's forthcoming "Wallace and Gromit: The Curse of the Were-Rabbit." For me, it is the very slight jerkiness of the motion that enhances its appeal, giving it a different kind of reality than the smooth movements within modern animation (whether drawn or produced by computer). It's not that I dislike state-of-the-art animation; it's that I like variety. A. "The Talent Given Us," directed by Andrew Wagner, is a fiction film in the form of a documentary, with Wagner's family playing themselves. I asked him if the title was a quotation. He responds: "It's from a line of dialogue in 'Southern Man,' one of my own scripts that takes place in the South in the '50s, so it's possible it originates from the civil rights and period research I did. 'Talent' had a different working title early into the editing. I was on the lookout for a new title that better captured the themes and comedy of the film, and I came across 'The Talent Given Us' while doing a rewrite on 'Southern Man.' It clicked for me. In my mind, 'talent' is a euphemism for the emotional patterns that are passed along in families." "There was a guy, a tramp comedian named Joe Jackson. He was famous for how he handled the curtain. He had these big, floppy shoes, and he'd stand onstage just where the curtain fell, so his toes would be sticking out under the curtain. So the audience knows he's still there. They go crazy, applauding. Meanwhile, Jackson slips out of the shoes. He waits until the applause is dying down, and then he steps out from the side of the stage in his stocking feet. That brought the house down. "One night, the curtain comes down. Jackson steps out of his shoes. Then he dies backstage. Drops dead. The audience knows the gag, see, and so they're cheering, applauding ... the greatest ovation Joe Jackson ever got, and he didn't live to hear it. "When I tell that story, people sometimes burst into tears. I hate to break the news to them that I made it up."